Yesterday’s early price action on the euro vs dollar pair was dominated by a further 4.3% fall in the Shanghai Composite, just two days after a 5.8% decline, leaving the Index 19.8% down from its 2009 high, achieved on 4th August – theoretically marking the start of a bear rally. However, Europe and Wall Street managed to hold firm and once the crude oil inventory figures had been released causing oil prices to race above the $72 per barrel price point, equities regained their poise along with the Euro. The euro vs dollar forex trading session ended the day on a relatively wide spread up bar but with a deep lower wick. 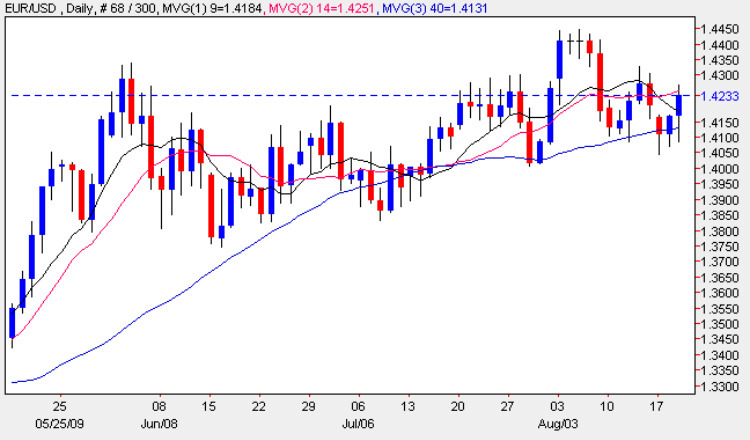 Interestingly the trend of higher lows continued yesterday as we suggested it might, with the low of the day finding support yet again from the 40 day moving average as the Eurodollar once again attempts to push through the USD1.43 price handle. The close of the session ended marginally below the 14 day moving average which seemed to offer a minor level of resistance. The key for today’s technical forex trading will be whether the USD1.43 level can be breached and, if so, then we may well see a further attempt to break out from this range in the medium term. My trading suggestion for today given the depth of the lower shadow to yesterday’s candle is to attempt small longs using tight stops on an intra day basis but with caution given the USD1.43 resistance level which is now very close at hand. With no fundamental news on the economic calendar for Europe, forex market traders will be concentrating on the unemployment claims, Philly Fed Manufacturing Index and the CBI Index due out later today. Should these exceed expectations then this may tempt traders and investors into riskier assets thereby causing yet more pain for the US Dollar.